Many of you may have heard about TechCrunch editor Michael Arrington’s harrowing experience on a recent Delta flight. Since then others have emerged complaining about poor service on the airline. While the airline may need to focus its efforts on its customer service, it looks like Delta has been hard at work on something else: its social media strategy. Today, the airline announced a new initiative that allows users to book flights directly on Facebook. 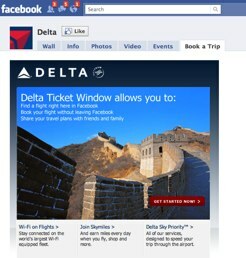 Called the ‘Ticket Window,’ the feature allows anyone to book a flight directly from Delta’s Facebook page. It looks like they are one of the first airlines to allow a full travel booking on the social network. And Delta says that it will expand the Ticket Window, which is powered by Alvenda, to other social media sites, including online banner ads to allow full booking capabilities within the airline’s advertisements. It’s unclear if Facebook gets a cut from any of he flights booked on the platform. While it’s commendable that the company is looking to social media to boost sales, Delta is not the first airline to use the social web to reach consumers. Southwest, Virgin and event JetBlue have been communicating deals and information to customers via Twitter and Facebook for some time. I’d expect these airlines to start rolling out a similar sales feature to Ticket Window soon. And perhaps Delta should be focusing it’s efforts on actually improving customer service before bringing more customers on board flights.